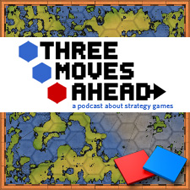 I started Three Moves Ahead as a dedicated podcast about strategy games in 2009. Since then, the show has gone through a number of changes in style, not to mention the evolution of the panel, but I’ll tell what the show is about now. The show is co-owned by me and Rob Zacny, the managing editor at Waypoint. Each week (or thereabouts) a panel led by Rob, myself or one of our other regular panelists (Fraser Brown, Bruce Geryk, TJ Hafer and Rowan Kaiser) dedicate an entire show to a single topic. We talk about current games, classic games, recurring mechanics and themes. Three Moves Ahead is produced by Michael Hermes. Because of my job in development, most executive decisions are on Rob’s plate, but for nine years, I have described Three Moves Ahead as the best thing I’ve ever created, so I’m not going anywhere. Three Moves Ahead is supported by Patreon. Official page and list of shows here.